RBI Recruitment department issued an official notification in which they said that they want to filling up the vacant positions in their various branches. They introduce this official notices on the RBI official website. We took this complete information from that PDF file only. We share the reference link related to this RBI Recruitment under IMPORTANT LINK section below. 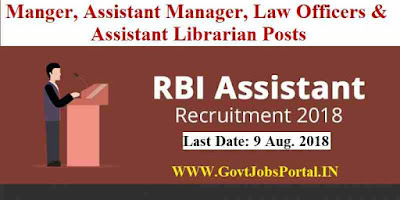 RBI is looking to heir fresher and experience candidates for the following positions: “ Manager, Assistant Manager, Law officers & Assistant Librarian”. Those who are interested in these RBI Jobs can apply online through the RBI official website. Before applying for this RBI Recruitment must read this complete post carefully. We explained all the important information below here in this article. What is the Educational Qualifications required for applying this RBI Recruitment? 1). For Manager (Technical – Civil) – Candidates having a Bachelor’s degree(BE/B.Tech) in Civil Engineering with at least 60% marks in an aggregate can apply for this position. Age Bond: Must have age in between 21 to 35 years. 2nd Class Master’s Degree in English with Hindi as Core/Elective/Major subject during Bachelor’s Degree level. Age Bond: Candidates having age in between 21 to 30 years can apply for these posts. 3). For Assistant Manager (Protocol and Security) – Only those applicants are eligible who are an Officer with a minimum of five years of Commissioned Service in the Army/Navy/Air Force. Age bond: Having age in between 21 to 40 years can apply for these jobs. 4). For Legal Officer – Graduation degree in Law subject from a will recognized university of India with 50% marks or equivalent in the aggregate can apply for these posts. Age Bond: Must have age less than 32 years for applying this Post. 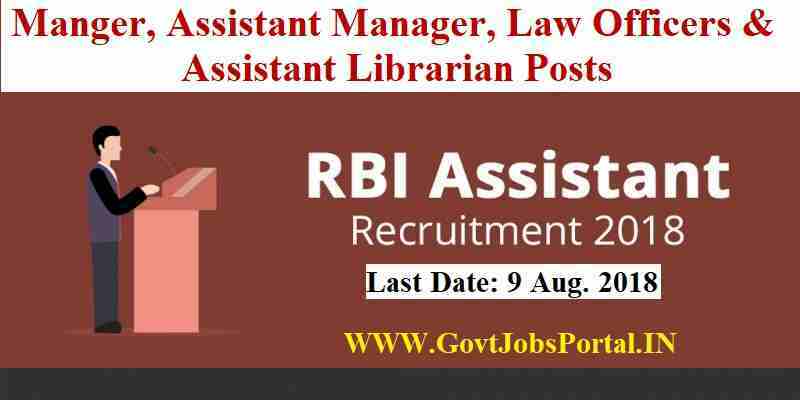 5) For Assistant Librarian – Candidates having a Graduation Degree in Arts/Commerce/Science and Master’s Degree in ‘Library Science’ or ‘Library and Information Science’ can apply for these posts. Age Bond: Must have age in between 21 to 30 years for applying this Post. What is the PROCEDURE FOR APPLYING ONLINE? (i). Applicants full filling the conditions of eligibility which we explained above in this article as on the following dates “1st, July, 2018” are first compulsory to visit the URL “Recruitment for the post of Non-CSG -2018“on the official Bank's website which is “www.rbi.org.in” >Opportunities@RBI>Current Vacancies > Vacancies and click on the hyperlink “Online Application Form”, when you click on the online application form it will redirect you to the registration page. (ii) Applicants will have to enter their basic details and upload the photograph and signature in the online application form as per the specifications given. (iii) After filling up the application form with your detail including photograph and signature candidates, please verify the details which you filled online before clicking on the SUBMIT button. 9TH Aug. 2018 is the End Date to accept Online Application.